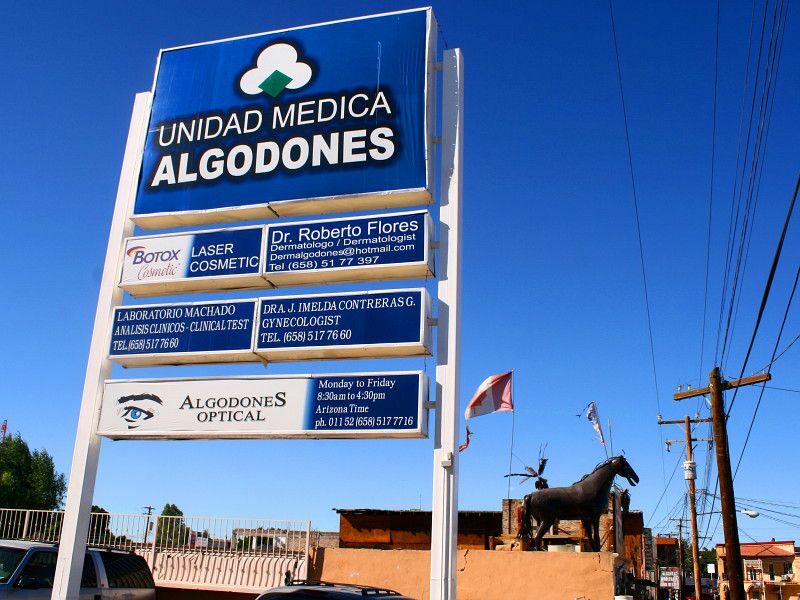 Algodones, Mexico is a popular border town destination for medical tourism for residents of the United States and Canada, offering more pharmacies, doctors, dentists, and opticians in a concentrated area than anywhere else in the world. Here, Americans and Canadians alike can find heavily discounted prescriptions, eye-glasses, and medical and dental care that are each as high quality as the same procedure or service back home. Algodones is located 7 miles south of ​Yuma, Arizona off Interstate 8, but you will be crossing the border at Andrade, California in order to access this small Mexican town located in the state of Baja California. Open daily from 8 a.m. to 10 p.m., travelers can cross the Andrade border station either on foot or in their car, and parking lots are available for a low fee from Native American tribe members who own lots in the area. It's best to park in the lot on the U.S. side and walk over as it eliminates possible complications of getting your car back into the United States. Still, entering Mexico is virtually effortless for American and Canadian citizens—no one checks your ID or inquires about what you are bringing in. Just stroll across, and voila,’ you are in another country! Immediately when you arrive in Algodones, you will notice the overabundance of pharmacies and medical offices—some simple and very “south of the border looking" and some new and not unlike what you will see in any American town. The pharmacies have handwritten signs touting their prescription prices and staff members eagerly beckoning you to enter their stores. Everyone speaks English and during the day the town is filled with older Canadians and Americans. It’s best to look around before you attempt to purchase anything. That goes for pharmaceuticals, vanilla, souvenirs, or liquor. Most people can eat the food served in the local restaurants and have a margarita without worrying about water-related issues, but you should keep in mind that the margaritas may be pretty potent so adjust your consumption accordingly. If you are able to find it, enjoy an al fresco meal while listening to live music at El Paraiso (The Garden Place), but be warned, this patio isn't easy to find on your own so you should ask a vendor to point you to the right place if you get lost. There are restrooms just across the border. Others are in the restaurants and are, in general, reserved for restaurant patrons. The restroom at the El Paraiso restaurant in the courtyard was exceptionally clean. People don't travel to Algodones for the souvenirs, pottery, apparel, or glassware shopping, they come for the medical goods and services. Still, you may be able to find a fun beach dress, straw hat, knock-off purse, or silver bangle to take back with you. We recommend bringing cash for all your shopping needs as most vendors accept bartering and bargaining for better prices. All prices are in United States dollars, so offer half of the asking price and go from there. If you are interested in prescriptions, it is best to talk to others who shop there regularly and know the routine and especially important to know the designer and generic names for your medications. While prices may be good, the names of some major prescriptions, as well as their active ingredients, are slightly different. Visitors should be cautious and check the expiration date on each container. Also, keep in mind you are only allowed up to a 90-day supply of prescriptions to carry back across the border, so don't purchase too much medicine—the border agents will confiscate the excess drugs. We recommend talking to others before you decide to take the plunge and make a dental appointment, buy glasses, or see a doctor as this is very much a word-of-mouth system—while there will be scrub-clad staff outside of dental offices inviting you in for an exam, it is best to check with friends or those who frequently use the services for recommendations before considering a procedure in Algodones. Interested in vices? There are some large liquor stores (they are purple) with a great supply of bargain liquors, chewing tobacco, and cigarettes, but be sure and check on the limits of border crossing before you load up. As of June 1, 2009, passports and passport cards are the only form of identification that is accepted at the U.S. to Mexico border crossing, but passport cards only allow for travel by ground transportation, so if you're planning to fly to Mexico and travel up to Algodones, you'll need to have a full passport. When you approach the officials at the border, they will interview you one by one, examine your identification, and ask you what you purchased. Be sure to check the Border Service Agency website for a complete list of permitted and prohibited items, but you should be fine with small purchases like single bottles of tequila or souvenirs like straw hats. If you purchase medicine, you'll have to show the original packaging so border agents can verify the legitimacy of the drug. Although the wait at the border can be long at times, Algodones has provided some benches and light shade. It is a good idea to carry a bottle of water with you for the time in line. If you are on a schedule be sure and watch the line at the border crossing. If it starts winding around the corner and back up the street, it might take you an hour or more to get through the crossing to the U.S. side. This is typical in the middle of the day during the winter, but if you wait until later in the day or visit off-season, you might find no line at all.